We have our own in-house design and production facility to help you personalise the memories of a loved one and for people to share on the day of the funeral. Simply give the funeral director all the information when you meet, or you can pop in and talk to our friendly designers who will only be too glad to help. Take a look at a selection of our personalised Order of Service Sheets by clicking here. Reflections is a very popular service which The Walter C. Parson Group are able to offer their families. By providing us with a selection of favourite family photographs and suggesting a favourite piece of music, we are able to produce a collage of photographs which is integrated with the music and shown during the service on a large screen television. This gives a chronological insight into the life of your loved one and a truly personal tribute during the service. All this is subject to the officiating Minister’s approval, particularly when the funeral service is taking place in Church. Afterwards we provide three Cd’s of the “Reflection” for the family. We offer a wide range of memorialisation options for cremated remains (ashes). These include traditional caskets, urns, candle holders, keepsakes and jewellery, all of which can hold a small portion of cremated remains. The full collection can be viewed by selecting the Useful Links section of our website and selecting Funeral Products. A selection of products are also on display at our offices. As well as advising on more traditional options such as interring or scattering cremated remains, we would be pleased to discuss alternatives with you. Cremated remains can be placed into jewellery (Ashes into Glass), a firework, a tattoo, or even sent into space. Walter C. Parson are flexible enough to listen to and attempt to supply any of your special requests, just let us know what you require and we will provide definite information for you to consider without obligation. We regularly provide green funerals, humanist ministers, colourful coffins, green burials and different types of hearses. We have even conducted burials on people’s own land and full burials at sea, although it must be understood that these are technically challenging and take some considerable time to arrange it can be done! We will attempt to provide any service you request from the contemporary to the traditional and as long as it is legal we will do our best to accommodate your wishes with our normal seamless style. Walter C. Parson provides a funeral service for those families who need us at a time of grief. We pride ourselves in the personal service we provide, acting professionally at all times, and conducting ourselves with sympathy and understanding. We are convinced that the service we offer is second to none, and part of our commitment is continual training to enable all of us to maintain and continually improve on this high level of service. Trained staff are available 24 hours a day, every day of the year. Through our qualifications and professional associations, we have contacts throughout the United Kingdom and abroad. We have exhaustive reference points in place to assist us in satisfying the most complex of concerns. As part of our service and commitment, we will explain all details and at the same time give every request, however small, our full attention. We hope this will convey the commitment and integrity of each and every member of staff. We are proud to have grown from a small family owned funeral director into a group serving the South West Peninsula, covering Plymouth at St Judes, Crownhill and Plympton; Ivybridge, Tavistock, Torpoint, Saltash, Newton Abbot, Torquay and Exeter; all offering the same first class service. The NAFD Symbol has been adopted as a kite mark – a guarantee of high quality professional care for the bereaved. The NAFD Diploma in funeral directing is recognised as the gold standard qualification throughout the profession. As members of this association, we are also contributors to the strict Code of Practice. British Institute of Embalmers oversees the training and qualification of its members in order that they can carry out the beneficial embalming procedure to the highest possible standard. Only obtained by invitation, our quality is assured by our membership of Selected Independent Funeral Homes, a network of the World’s leading independent funeral directors. Member firms are operated by trusted local professionals who are often considered leaders in their communities and multi generation families who have a long tradition of helping people. The B.I.F.D. was formed in 1982 by a group of highly experienced, qualified Funeral Directors to provide an organisation that cared for professionally qualified individuals working within the Funeral industry. The Institute’s main aim is to promote educational services within the profession. Walter C. Parson place great emphasis on qualifications as long as they are added to experience. At present, we have 24 holders of the Diploma in Funeral Directing, and five qualified members of the British Institute of Embalmers. We are also members of the British Institute of Funeral Directors. 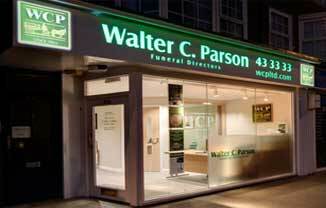 Walter C. Parson are proud of their staff. Continuous in-house training programmes are organised to improve the quality of service we are able to offer our clients.